Smitty & Miles Improv shows this Summer! Elizabeth’s brother Eric is working on a film, The Free State of Jones, near New Orleans. All the Heffron clan converged on his 1852 shotgun townhouse in The Garden District. I lived in New Orleans for eight months in 1984, the year Detlef Shrempf lead UW to the Elite Eight. Cindy Lauper’s songs played incessantly in The French Quarter. Amyl Nitrate was in the air. Purple Rain was showing on Canal Street. I was there to help a friend re-open Lucky Pierre’s, an old restaurant on Bourbon Street. When I left New Orleans I expected never to return. It had been my version of China Town, with Jack Nicholson. (“Forget it Jake, it’s China Town”). My circumstances were less dramatic than Jake’s, but I did return home to Seattle with fresh scars and hematoma from a double hernia operation. These marks gave utterance to a twisted mass of internal carnage. If bottom is that place where you stop digging, this was it for me. I was barely strong enough to drive my rusty ’59 Volvo. On its way was the realization that I had nothing important to lose, and that I might as well subject myself to the public mortification of attempting comedy, just to get it over with. And then there was me, staring at the historic hole left behind. Though remnants of my old self remain, some time during “real life” over the last 31 years, an incoherent cloud has lifted. Walking around the old haunts, muscle memory wafted in and out, but it was faint, and had no pull. Any Voo Doo that might have had hold of me back then has been washed away. I was seeing the city with a beginner’s mind. Elizabeth and I had a fabulous trip, and this time, when I left, I felt certain to return. Twenty years ago, the artist Fred Saunders made an incredible painting of a boy’s treasure-like Map of Capitol Hill for the show. When we moved back from Bainbridge Island, the map was nowhere to be found. It baffled me. How could I lose something that big and important to me? Had I left it at a theatre? Well, when the film came out, the Nuns FB page got a message from a guy named Devin Sletager, a bike mechanic. A friend of his had found it several years ago next to a dumpster on Capitol Hill, and rescued it. Then that guy moved, and Devin took it in. It had been hanging on his wall! I went over to his house and picked it up! So if you meet Devin Sletager, be nice to him, OK? Whatever he needs. Thanks, Devin! Here’s the current plan for the movie: To get on with it. We will 4-wall it (do it yourself) at a theatre in Los Angeles, at The Egyptian, and at the same time release it on Video-on-Demand (iTunes, Amazon, etc) and sell DVD’s. It will be some time this summer. Meanwhile, if you have a theatre and want to show it, we’re game! Call me! Know of a theatre in Brooklyn? Want a DVD? I will sell you one for $20! Just let me know, and I’ll send you one as soon as we get them. is booked for two weekends at West of Lenin! Yay! Fri & Sat, July 10&11, and Aug7&8, 8:00pm. Buy Tickets here! It was studying improv with Roberta Maguire, and teaming up with Rebecca Stockley to play Theatre Sports, when I came back from New Orleans, that began my rejuvenation. 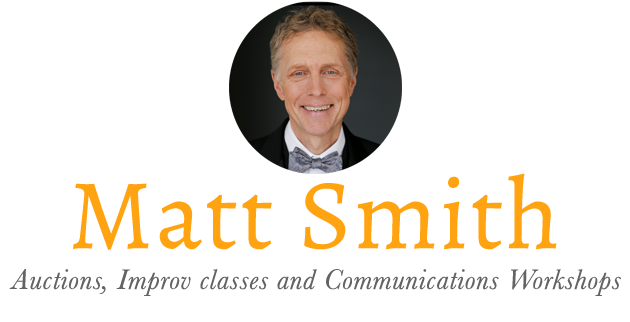 Returning to improv now as a performer, after several years, is humbling and invigorating. Colors are more vivid. Objects have sharper edges. Seriously. People are more nuanced. Old “stuff” I never dealt with is “up”. Not sure how that works. If you want to get into improv, this is the best way to get it into your bones. No experience required. We start from scratch, and by the end are doing long form improv. 65 hours of training! Five days a week, for four weeks, with two evening performances at the end. Please pass this on to anyone you think may be interested. @ Freehold, 2222 2nd Ave, in Bell Town. Pattie Miles (of the legendary Smitty & Miles) is partnering with now as part of a world-wide conspiracy to bring improv training to the entire world. If you would like to hear from us about bringing our work into your work, let me know. We will send you a simple letter. If you have any ideas for us we are open. We did five such workshops this Spring. This is how I hope to spend the next few years. I’m kind of an Evangelist when it comes to improv. I have taught some of these exercises literally thousands of times, and never tire of it. Lots of money has been shaken loose, and into deserving non-profits. What a bizarre way to fund our most important institutions! But it’s what we’ve got, and I’m lucky to be a part of all the important causes that include me in their families…Thanks for a wild ride this Spring. And thanks and strokes to my favorite auctioneer, David Silverman, who continues to share his best practices with me. Want to do me a favor? I have a new web site. www.mattsmithimprov.com. Please look at it and tell me what it requires….Thanks!